What is marketing? What is PR? How do they intersect? How do they relate to advertising? There is no shortage of discussion on these topics. In my opinion, marketing is the result of everything a company says and does. It’s how they provide consumers with a consistent, personalized experience across the many available channels of communication. For companies to keep customers, they have to be able to interact with them on all the channels customers use. Nothing about marketing is simple anymore. So I’m baffled that this idea for putting up a sign in the Bronx is described as a marketing campaign. It’s nothing but a sign. And an eyesore. It’s kind of like the Hollywood sign in LA, but without the glamourous. 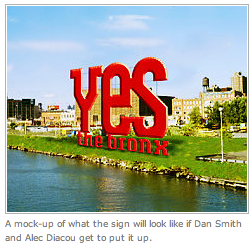 Dan Smith and Alec Diacou, whom the Daily News called “the brains behind a new marketing and merchandising campaign,” want to install a three-story tall red metal sign that reads “Yes the Bronx” on the waterfront facing Manhattan. “You can’t say no to yes,” said Smith. Clearly Smith and Diacou are very good at their own PR as they got 3/4 of a page in today’s Daily News. City Councilman Oliver Koppell (D-Riverdale) said, “A sign like that could make the Bronx look cheap or cheesy.” And I think Manhattanites will give the idea a Bronx cheer. Lemme know when you have a campaign planned guys. Or if you want help getting one together. Copyright B.L. Ochman, all rights reserved. Heh – obviously Dan Smith has not met you, and me, both of who can say no to yes. You’ve got to admit though, he got your attention. That however, isn’t marketing. BL – Sent here from a Susan Reynolds link on Twitter…this is hilarious! You’re right, they are doing fairly well in their own PR department…but how? “You can’t say no to yes.” Seriously? I love Kopell’s suggestion. Can you call all of these men soon and step in soon, BL? Working for an architecture and interior design firm focused on retail, I can tell you that signs are considered environmental graphics or even wayfinding — not marketing! Somehow, I think the guys over at the Yankees Entertainment and Sports Network (YES) are rooting for this big time. I wanted to learn more about “the brains behind a new marketing and merchandising campaign” – and their firm, DE Smith Corp., failed to show up on the first few pages.